Let’s face it: Most students don’t want to study more than they have to. As a result, many exhibit poor study habits, like cramming the night before (or the class before) a test, or blindly reviewing class notes. 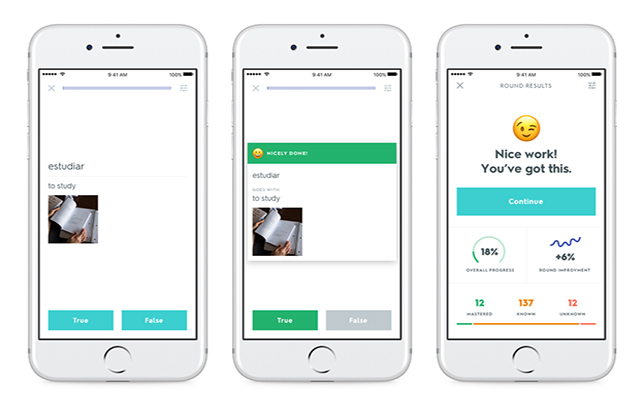 To help students kick bad study habits, Quizlet has added a new feature to its free app that enables them to study more efficiently and effectively using machine learning and cognitive science. Unveiled onstage at the SXSWedu conference taking place this week in Austin, Quizlet Learn takes the guesswork out of studying by giving students an adaptive study plan that tracks progress and helps them stay motivated with checkpoints and study reminders. How to use it: After launching Learn, students go through a quick review of study materials to see where they need to start. Next, it asks to input a test date, if one is coming up. Learn uses that information to build an individualized plan. As students study, it recognizes patterns, adjusting questions to be easier or harder and incorporating an array question types (i.e. flashcards, true/false, multiple choice, written and more) to keep them engaged. Learn updates the student on their progress and sends alerts on their mobile devices. How it works: CEO Matthew Glotzbach in a blog post announcement said that under the hood, Learn is powered by machine learning. To create Learn, the company's Learning Assistant Platform analyzed millions of anonymous study sessions to gain insight into how Quizlet students effectively mastered subjects in the past. That data combined with proven techniques from cognitive science, like spaced repetition, enable Quizlet Learn to show students materials only “as often as needed to master it,” Glotzbach explained. Quizlet Learn is expected to benefit tens of millions of K–12, college and lifelong learners in 130 countries worldwide, according to information from the company. The feature is only available on iOS for now, but the Quizlet will be rolling out Android and web versions soon. To learn more about Learn, watch the video below or visit the Quizlet site.